What's at stake in the Janus case. 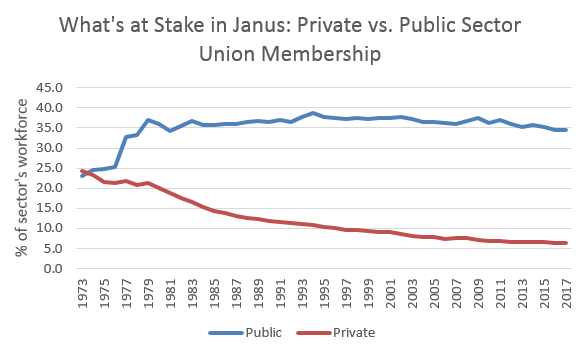 Lots of people think unions are pretty much kaput, but that's not so, especially in the public sector, where union membership has been a bit north of one-third of the public-sector workforce, and remarkably steady, since the late 1970s (private sector coverage, by contrast, is 6.5%; see figure). That's why the Janus case being argued at the Supreme Court today is so vitally important. Its outcome will either strengthen or weaken public sector unions, and if the result is the latter, it will have political repercussions far beyond the voice of workers in their workplaces. The Janus case is about whether public sector unions can require "agency fees." Such fees, also called "fair share" fees, are paid to the union to cover the cost of bargaining on behalf of all workers in the bargaining unit, not just union members. Absent such fees, there is a clear "free rider" problem wherein those benefiting from collective bargaining activities on their behalf pay no costs to cover the union's work. In that sense, Janus is kind of the public-sector corollary of the misnamed state "right-to-work" laws about which I've written elsewhere. The named plaintiff, Mark Janus, is an Illinois social worker covered under a collective bargaining agreement negotiated by the public workers' union AFSCME (American Federation of State, County and Municipal Employees). He's not an AFSCME member, but he's required to pay a fee to cover the cost of his representation. Note that such fees can only be used for this purpose, and not for, say, political activities by the union. The Trump administration is supporting Janus, hoping to persuade the court to overturn its 1977 ruling allowing states to require fair share fees for government employees. Two dozen states and the District of Columbia require such payments, covering roughly 5 million public-sector workers. The piece carefully goes through this "broader campaign," which has strong, and obvious, political motivations. The reason the SCOTUS is hearing Janus today is simple. It is because there is no single, larger, unified, better-resourced, pro-worker political voice in American politics today than that of the unions. Obviously, they're far from alone, but even in their diminished capacity, this remains the case, and that flat public sector line in the figure above is a main reason why. A recent paper by Mr. Hertel-Fernandez and two colleagues may foretell what Democrats can expect if Mr. Uihlein and his fellow philanthropists [the conservatives backers of Janus–JB] succeed. It found that the Democratic share of the presidential vote dropped by an average of 3.5 percentage points after the passage of so-called right-to-work laws allowing employees to avoid paying union fees. That is larger than Democrats' margin of defeat in several states that could have reversed their last three presidential losses. So, attention must be paid. The court considered a similar case in 2016, when it split 4-4 following the death of Justice Scalia, but there's considerable concern as to the outcome given the makeup of the current court. A lot hangs in the balance.